This survey of twenty-one gardens by Steve Martino, whose work blends colorful, man-made elements with native plants to reflect the sun-drenched beauty of the desert, is sure to inspire gardeners, landscapers, and admirers of California and the Southwest. For more than thirty years, Steve Martino has been committed to the development and advancement of landscape architecture in the Southwest. His pioneering work with native plant material and the development of a desert-derived design aesthetic is widely recognized. A recurring theme of his work is the dramatic juxtaposition of man-made elements with ecological processes of the region. His love for the desert--the interplay of light and shadow, the colors, plants, and wildlife--inspires his work. As Martino explains, "Gardens consist of two worlds, the man-made and the natural one. I've described my design style as 'Weeds and Walls'--nature and man. I use native plants to make the transition from a building to the adjacent natural desert." Though Martino's work is deeply connected to the natural world, he also has a flair for the dramatic, which is apparent from his lively color selections, sculptural use of plants, and keen attention to lighting, shadows, and reflections. Boldly colored stucco walls frame compelling views of the desert and sky, expanding the outdoor living area while solving common site problems such as lack of privacy or shade. Interspersed are custom structures molded in translucent fiberglass in vivid hues--colorful arbors, outdoor showers, and internally lit benches. Caren Yglesias teaches landscape architecture and environmental planning at the University of California, Berkeley. She is the author of The Innovative Use of Materials in Architecture and Landscape Architecture: History, Theory and Performance and The Complete House and Grounds: Learning from Andrew Jackson Downing's Domestic Architecture. Obie G. Bowman is an architect based in Healdsburg, California, whose practice focuses on the integral connection between the built and natural environment. Steve Gunther is a landscape photographer based in Los Angeles, California. 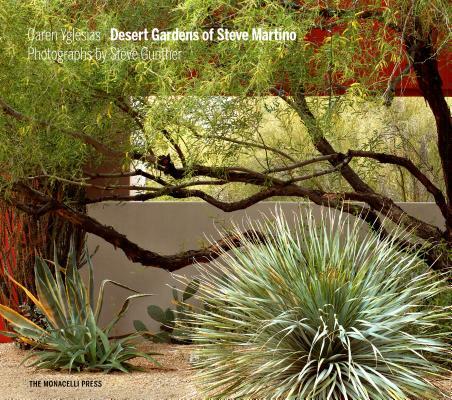 "DESERT GARDENS OF STEVE MARTINO, by Caren Yglesias, proves that no one uses palm trees — and other desert plants — more fluently. Part of Martino’s trick is setting plants that have few flowers but fabulous shapes against geometric slabs of deeply colored walls. The crimson hues in a Phoenix garden must be as much of a draw for the hummingbirds as the mirrored surface of the water trough. Blue concrete pyramids, magenta poles, yellow awnings and fiberglass panels — these are all elements in Martino’s playful, imaginative designs." "Scorching summer days in the deserts of the Southwest are not usually when the desert becomes inspirational. However, Desert Gardens of Steve Martino creates a beautiful printed 'garden' to enjoy. The reader will discover a new appreciation for the desert and its natural plants." "Jaw-droppingly beautiful garden profiles, 21 of them. Each profile features multiple photographs, a site plan, and a thorough description of the garden.... you quickly become immersed in the designs and find yourself dreaming about how to incorporate details into your own garden, be it in the desert, a rainforest, or a small urban lot..."
"Bring some natural beauty to your coffee table with the new book Desert Gardens of Steve Martino, which displays the work of the local landscape designer and Phoenix Home & Garden Masters of the Southwest award winner." "Landscape architect Steve Martino was born, raised and lives in Phoenix, so desert air is in his lungs. He is the ideal expert to show us gardens—even gardens growing on rooftops—in that sandy climate.... Author Caren Yglesias, who teaches landscape architecture and environmental planning at the University of California, Berkeley, weaves together Martino's words and wisdom with photographer Steve Gunther's striking photos—transporting us to this arid expanse. There's nothing barren here with Martino as our guide. He juxtaposes strong manmade elements—stucco walls, arbors, outdoor showers and benches—with nature, honoring the ecology of the landscape." "What designer is not a fan of Steve Martino? And this book tells you everything you want to know about the ways to achieve harmony between residence and garden and the landscape beyond.... Martino's site plans and drawings add to the lovely nature of this book, one that any designer would treasure forever."